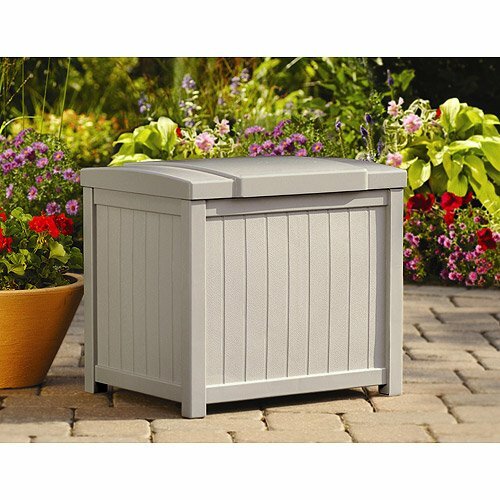 Add a reliable storage solution to your patio with the Modern Style Light Taupe Deck Box. Featuring long-lasting resin construction, this deck box will serve its purpose for a really long time. Ideal for both indoor and outdoor use, this resin deck box provides a storage space of 22 gallon to accommodate garden supplies, sports equipment, clothing, and many more. With a stay-dry design, this deck storage box ensures that the contents are kept dry. The deck storage box can be assembled in no time, requiring no tools - just snap the parts together and click, the storage box is ready for use. This Modern Style Deck Box is easy to maintain too. Available in taupe, this storage box will certainly make a great addition to your outdoor space. Add a reliable storage solution to your patio with the Modern Style Light Taupe Deck Box. Featuring long-lasting resin construction, this deck box will serve its purpose for a really long time. Ideal for both indoor and outdoor use, this resin deck box provides a storage space of 22 gallon to accommodate garden supplies, sports equipment, clothing, and many more. With a stay-dry design, this deck storage box ensures that the contents are kept dry. The deck storage box can be assembled in no time, requiring no tools - just snap the parts together and click, the storage box is ready for use. This Modern Style Deck Box is easy to maintain too. Available in taupe, this storage box will certainly make a great addition to your outdoor space. 22-gallon capacity. 2.9 cubic feet. Great for indoor or outdoor use. Great for garden supplies, clothing, sports equipment and many other products. Stay-dry design. Long lasting resin construction. Easy assembly. Assembled Product Weight: 13 lb. Dimensions: 22.5L x 18W x 20.5H in. If you have any questions about this product by Cosmic Furniture, contact us by completing and submitting the form below. If you are looking for a specif part number, please include it with your message.